Because sometimes love has to be taken into our own hands. Just kidding! But love truly wasn’t in the plans when it came to Luke and Emma pairing up to help save his family as well as Emma’s company. Right now until October 9th, you can enter to win a signed copy of The Wedding Plan, the latest hot release in the Veils and Vows series. Escape to Blueberry Springs! Giveaway ends October 09, 2017. Countries available: US, CA, and GB more! The latest book in NY Times bestselling Jean Oram’s new Veils and Vows series. Irresistible, sweet romances set in the small mountain town of Blueberry Springs. Love? It’s not in the plan. Falling in love wasn’t part of the plan. Luke and Emma need each other, but not for a clandestine rendezvous like they have in the past. No, Emma needs an experienced business partner to help launch her new product line, and—thanks to a recent personal scandal—Luke is the only one who will take her calls. All she has to do is convince this CEO to abandon his post and move to the small mountain town of Blueberry Springs. Luke knows Emma’s plan is perfect—as long as she agrees to marry him. Not only will their professional partnership earn his company some much-needed positive publicity, but most importantly, their marriage will help him fulfill his grandparents’ last wishes so he can protect their legacy from being squandered by the next in line. They’ve promised their past mistakes won’t impact their secret wedding plan. They’ve promised not to kiss…not to fall in love. The problem is, both Luke and Emma harbor enough secrets to destroy even the best laid wedding plans. Will these two lose everything when the truth rises to the surface? Or will they overcome their past so they can claim their future? Fall in love with the latest irresistible read from NY Times bestseller Jean Oram and the small town of Blueberry Springs. Purchase your copy of The Wedding Plan today and escape into the series that keeps romance readers up all night. All books in this series can be read out of series order so jump in anywhere and fall in love with the unexpected. 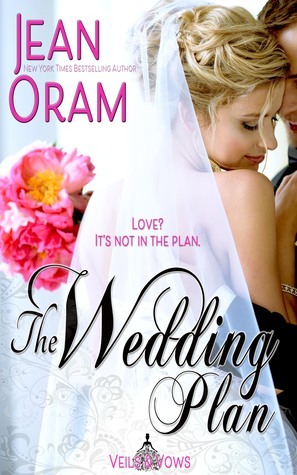 This is a brand new release from NY Times bestselling romance author Jean Oram. Don’t forget to friend or follow Jean on Goodreads and add the series to your shelves for more great updates from your favourite reader site–Goodreads! See you over there.